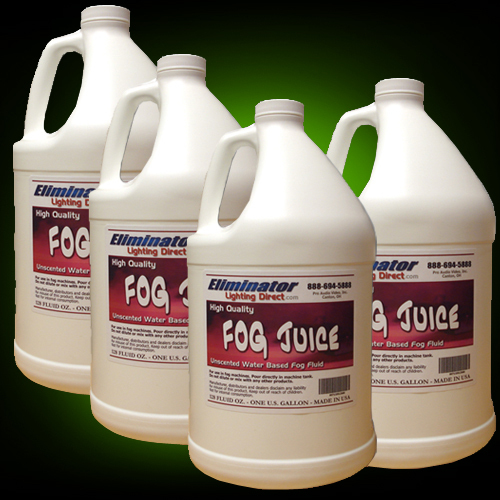 High Quality Fog Juice - 4 Gallon Case - Best Seller! Model Number: Fog Juice - Buy 4 and SAVE!!! You will receive Qty. 4 of the 1 Gallon High Quality unscented water based fog fluid. Works in any fog machine! This fog has been a best seller for 20 years. With less than 1.5 parts per million of mineral impurities, this fog fluid test's better than most brands selling for much more!! It is a triple filtered blend, designed to create a thick, rich cloud of fog from any conventional fog machine.